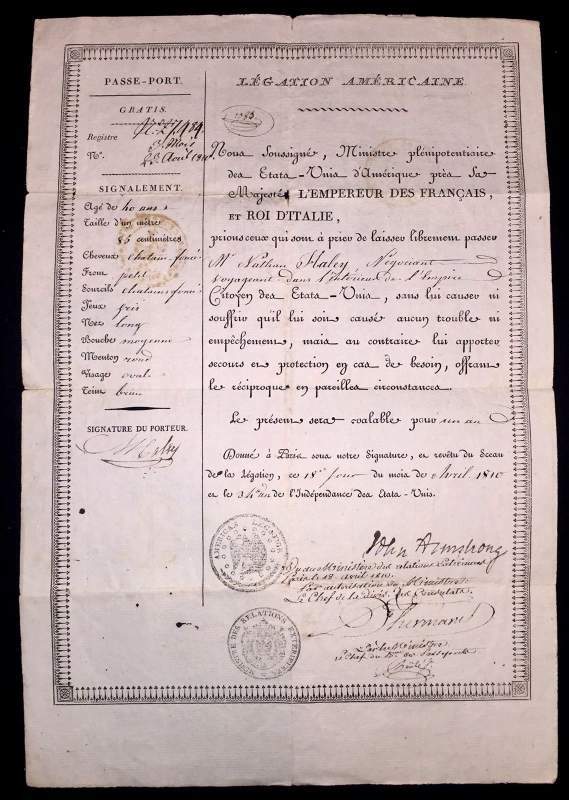 Here comes a great US Passport 1810, Legation in France issued by John Armstrong (in his last months as Minister to France – appointment by Thomas Jefferson in 1804) which found its way to a British fellow collector. ARMSTRONG, John, Jr., (son of John Armstrong [1717-1795] and brother of James Armstrong), a Delegate from Pennsylvania and a Senator from New York; born in Carlisle, Cumberland County, Pa., November 25, 1758; attended Princeton College but left college to enter the Revolutionary Army; secretary of state of Pennsylvania 1783-1787; adjutant general for several years; Member of the Continental Congress 1787-1788; moved to Dutchess County, N.Y., in 1789 and settled near Lexington Manor; elected to the United States Senate to fill the vacancy in the term ending March 3, 1801, caused by the resignation of John Laurance; reelected in 1801, and served from November 6, 1800, to February 5, 1802, when he resigned; was next appointed to the Senate to fill the vacancy in the term ending March 3, 1807, caused by the resignation of his successor, De Witt Clinton; subsequently elected to fill the vacancy in the term ending March 3, 1809, caused by the resignation of Theodorus Bailey, and served from February 25, 1804, until June 30, 1804, when he again resigned to enter the diplomatic service; Minister to France 1804-1810; also acted as Minister to Spain 1806; during the War of 1812 was commissioned brigadier general; Secretary of War in the Cabinet of President James Madison 1813-1814; engaged in literary pursuits; died in Red Hook, Dutchess County, N.Y., April 1, 1843; interment in Rhinebeck Cemetery, Rhinebeck, N.Y.
We, the undersigned, Minister Plenipotentiaries of the United States of America, His Majesty the Emperor of France, and King of Italy, who are requested to allow Mr. Nathan Haley, Trader/Businessman, traveling in the French Empire, from the United States, to travel freely, without causing him or her to suffer any disturbance or impediment, but, on the contrary, to assist and protect him when necessary, reciprocal offshore in circumstances. The will be valid for one year. Given under our Signatures, revives the seal of the Legation, this 18th day of the month of April 1810, in the 34th year of Independence of the United States. 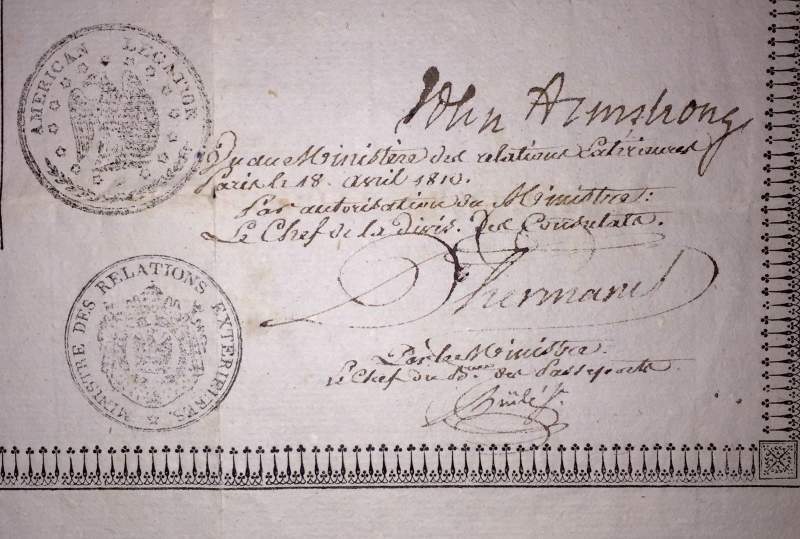 1st Signature: John Armstrong as Minister to France. 4th:Nathan Haley, US Consul to Nantes, France (1839-41).